Our First Planned Destination. On Monday we arrived in Palm Beach County, Florida to see my dad who lives in Boynton Beach. He will be 92 in August. He still lives in his house, drives during the day and goes to church regularly. It had been a few years since we had seen him last and he wanted me to look at couple of things that need repairs. The ride down the Florida peninsula was pleasant as I-95 is flat, well maintained and 3 or more lanes wide in each direction. I put Phaeth on cruise control at 60 mph and let everyone pass me so driving was a good as it gets. 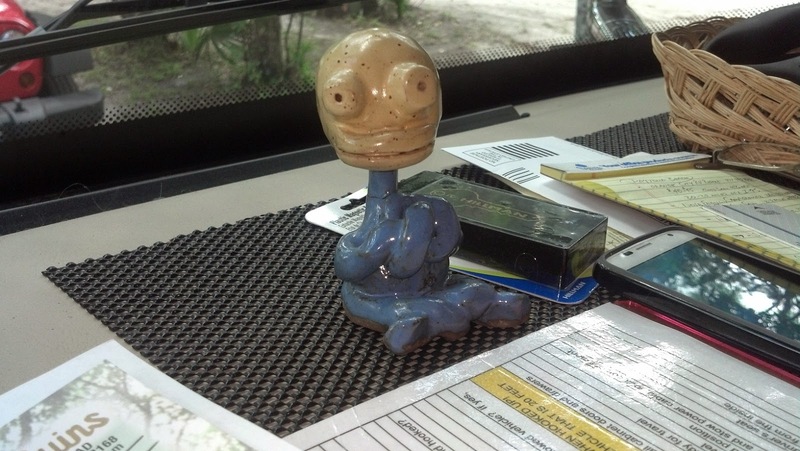 This is our traveling companion who mostly sits on the dash and looks out the windshield. He doesn't ask for much and just nods his head in agreement with what ever the discussion is at the time. 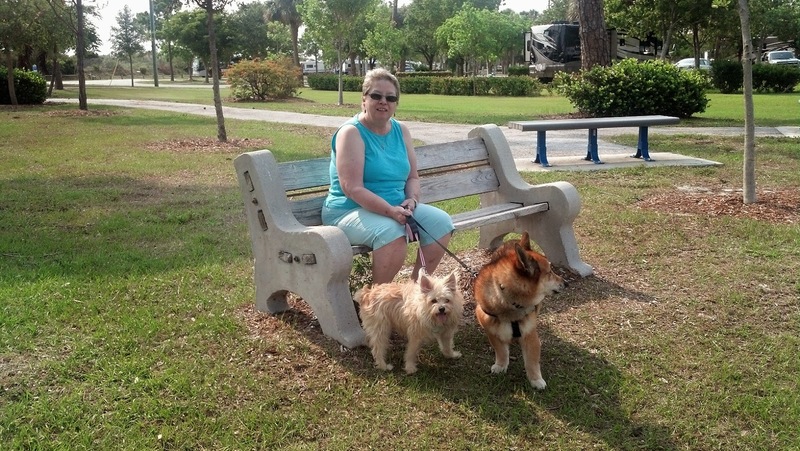 Mostly by chance (or perhaps price) we chose to stay at John Prince Park RV Campground in Lake Worth. It does not have a very visual presence on the internet so you cannot really see how wonderful a place this is until you get here. It is close to dad's house. It is a county park meticulously maintained with all paved roads and pads. Colorful foliage abounds and we are just a few steps from a lovely lake. The county sheriff and the park patrol drive by several times a day and park is gated and closed at night. We are here in the "off" season so all the snow birds have long since flown back north and there is plenty of room and sight selection to choose from. There is a real dog exercise area, plenty of benches and the campground is large enough to give you a good walk in the evening. We are planning on staying two weeks. Yesterday Joanie was very busy practicing her organizational skills (which are second to none) stowing and re-stashing stuff in Phaeth. We moved some more stuff to the basement and Joanie rearranged her cabinets for dishes, pots & pans and pantry stuff. Joanie is getting us more comfortable all the time. I'm getting pretty shaggy and need to find a barbershop today and Joanie wants to go shopping for some new tops. I cannot tell you how much I am enjoying YOUR retirement. Your posts make clear God's guidance and love in the wonderful adventure you have chosen. To live each day awaiting God's next surprise is joy multiplied. Love you guys!